HP's Envy line is the company's high-end range - the top-class stuff, in theory - but has produced mixed results recently. We were impressed by the Spectre XT and Envy X2, but weren't so sure about the Envy 6 or Envy 4. But the HP Envy TouchSmart 15-j004ea is closer to what the Envy line originally stood for, so we always had high hopes for it. It's simply a highly spec'd machine, fitted into a smart chassis. Inevitably for a Windows 8 laptop, it has a touchscreen. But it's generally aiming straight at being a regular premium machine, without gimmicks or being incredibly small and light. Think MacBook Pro or Samsung Series 7 Chronos rather than MacBook Air. Indeed, at 29.9mm thick and weighing 2.56kg, it's far from being an Ultrabook. But what you get in exchange is a superb spec sheet. There's a quad-core Intel processor, a 2GB Nvidia graphics card, a colossal 16GB of RAM and a generous 1TB hard drive. That's all combined with a 1080p screen, Beats Audio speakers, a full-size keyboard and multitouch trackpad, and four USB 3.0 ports (most laptops will only give you two SuperSpeed ports). It's all particularly impressive for the price. At around £1,000, it's great value for pros, making the extra £500 you'd spend on a MacBook Pro or Razer Blade Pro seem steep if the core specs are what you want. HP isn't just applying the premium features to what's inside the machine, though - it's taken a stab at upping the build quality on the outside, too. The casing is partly aluminium, specifically on the top and sides of the bottom half of the machine, making it feel solid and high-quality in use. It's a little bit of a cheat, because it reverts to plastic on the bottom, but that's not to the detriment of the overall build quality. 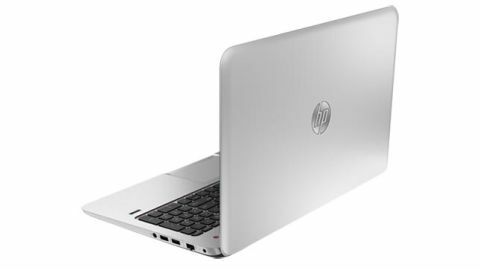 There's very little of the creaking or flex you get on cheaper laptops - except for on the back of the screen, where the case does bend quite a lot. We doubt it would be enough for the screen to get damaged in normal use, though. There's also a little bit of give beneath the keyboard, but from our time with it, we don't see any effect that would have on durability.